Last December, D.J. Kohnen and Rae Bailey opened a new business in Roscoe: the Downtown Bar and Grill. However, it is commonly known as D.J. 's Bar and Grill, in recognition of its owner. Kohnen dreamed of opening a bar for many years and talked with his dad "about how neat it would be to own" one, he said. He and Bailey purchased an old antique store building to renovate two years ago. The building is about 150 years old, according to Kohnen, and a lot of work was done on it before the bar was opened at the end of last year and before the kitchen opened this spring. Previously, the bar was a grocery store and may have served other functions before it was, most recently, an antique shop. It stood empty for five or six years before they bought it, estimated Kohnen. D.J. Kohnen and Rae Bailey opened the Downtown Bar and Grill (commonly called D.J. 's Bar and Grill) in Roscoe in December. After gutting the whole building, Kohnen and Bailey - who will be married in August - revamped it entirely. A wall was removed, the sloping floor was altered and refinished, and many other changes were made. All the work was done by the couple except for plumbing, heating, and electric, they said. Visiting other bars gave them ideas for their own, and they went to auctions and secondhand stores to find deals. The only new things in the entire building, said Kohnen, are the wall paneling and some of the trim. Kohnen ran the remodeling while Bailey followed his directions as it all came together.. "He'd say, 'Can you see it?' and I couldn't, but he knew how it would be," commented Bailey. 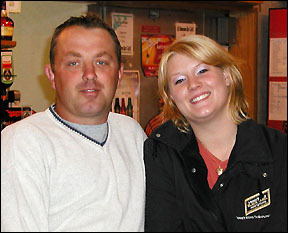 Kohnen, a 1995 Paynesville graduate and Roscoe native, had not even bartended before the bar was opened. However, now he bartends, cooks, and manages in addition to working sewer and water construction. Bailey will fill in, if needed, though she doesn't regularly work at the bar and is a maintenance tech at Grede Foundry. Throughout the year, there is a band at D.J. 's Bar and Grill nearly every Saturday night and there are deejays on Fridays, so the dance floor gets it use, said Bailey, who grew up in Paynesville. Pool tournaments and a motorcycle run have also been hosted there. The couple, along with Bailey's daughter Sonja Annis-Kohnen and their daughter Sabrina Kohnen, lives in Roscoe.